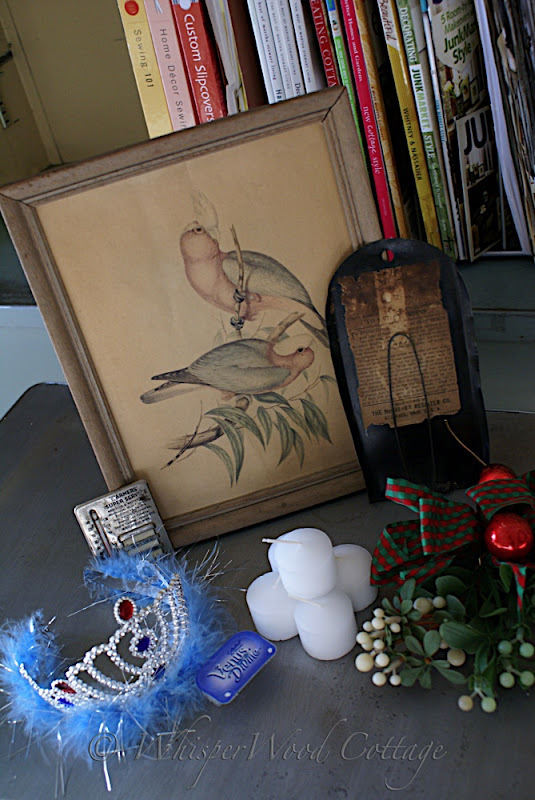 The framed bird image was only a quarter! Wait 'til you see how it adds charm to the vignette in the guest room! There's a small metal thermometer/oil change indicator from Warners' Super Service in Minneapolis. Metal ones like these were before my day...any one remember these? Then there is some kind of check/receipt thingy from the The McCaskey Register Co. out of Alliance, OH. Read the link for their history. The votives (47 of them total) were a nickel a piece. They were added to my stock of candles...can you ever have too many? Don't you love the tiara (for my princess of a niece! ), the razor (for my err...too personal...never mind! ), and the mistletoe (for my dear RJNJ! Pucker up, Butter Cup!)? All from the free box no less! Score! Seeing as there wasn't much junking action going on in town, I headed to old faithful...a local antique store. My fave vendor did not let me down! 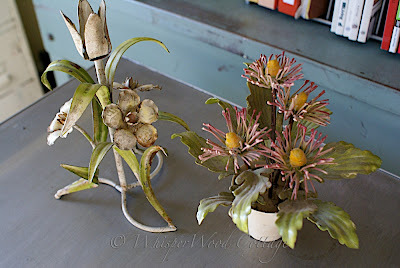 There they were in all there glory...two tole flower items. On the left is a candlestick. On the right is a simple centerpiece. I soooo love them! They instantly found a home in the master bath! Don't they look lovely? If you happen to have any tole floral pieces like the ones above and you are willing to part with them, please let me know! Like the 2Chippy's and their butter pats, I could not possibly have too many of these! Or, dear friends, if you are out junking and see these at a reasonable price...put in a call, send an email, write it in the sky...somehow get word to me! All for the love of tole! True...you can never have to many candles!!! 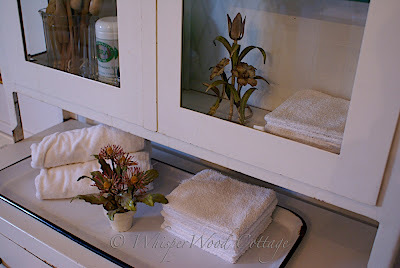 I also like how you're using the enamelware black and white tray in the bathroom. One of those why-didn't-I-think-of-that things! Oh, yeah. The tole flowers are pretty awesome! The prices at the garage sale were fantastic too. What great finds! I really like the bird print -- you'll have to show a pic of it in your guest room! Hi, Alvn, thanks for stopping by! I know, we junking girls have to stick together. Love me some junk & will be ready to get out there when it warms up about March or so. It's an addiction, I think! This economy is so bad that some people have had to sell their things anywhere or whenever they can just to survive. I heard on the news the other day that some woman had sold her Grandmother's set of china just to keep the lights on. It's really so sad. That is awesome! It's amazing what you can find in the middle of non-garage-sale-season if you aren't afraid to get out there! Way to go! I like the tole floral pieces. Are those metal? I need to investigate that. Those look fabulous in the master bath! A garage sale in Jan...in Minnesota!?! It worked out! Great finds! I love yard sales and always get sad in the winter when there are NO sales going on. I love your pictures.